TIME PERSON OF THE YEAR 75TH ANNIVERSARY Time Collector’s Edition Book: Time Person of the Year 75th Anniversary Celebration 1927 to 2001; 138-page large book. Starting in 1927 with Charles Lindbergh and ending in 2001 with Rudy Giuliani. There is a list of the 75 names of persons who were featured on the cover. Some of them are: Gandhi, Chiang Kai-Shek, Hitler, Stalin, the U.S. Presidents, Khrushchev, Gorbachev, Martin Luther King, Newt Gingrich, Popes, etc. 138 pages of impressive news photos and articles. Plus Albert Einstein, Person of the Century. Time Person of the Year 75th Anniversary Celebration Collector's Edition. For each of the last 75 years, TIME has presented a Man of the Year - the single person (man, woman or even idea) who, for better or worse, has most influenced events in the preceding year. Now, as TIME celebrates its anniversary, they present an individual portrait of all its previous Men of the Year. Popes, presidents and prime ministers, astronauts and aviators, prophets and protesters, queens and kings, legends and heroes and even a few villains. You’ll meet them all as TIME celebrates the 75th anniversary of the Person of the Year. Here are the great makers of history in our time, from pioneer flyer Charles Lindbergh, TIME's first Man of the Year, to heroic Mayor Rudolph Giuliani, TIME's most recent Person of the Year. In this fascinating book - beautifully illustrated with hundreds of great photos from TIME's vast picture library - you'll revisit some of the most electrifying moments of recent history. You'll journey to the moon with the Apollo astronauts. Stand with Winston Churchill to defy Hitler's troops. Join Ronald Reagan in Berlin to urge "Mr. Gorbachev, tear down this wall!" And you'll relive the great social movements of our time, as Mahatma Gandhi leads India to independence, Nelson Mandela leads South Africa from the prison of apartheid, American women march to equality with men and Martin Luther King makes an eloquent plea for human rights - from inside a jail cell. 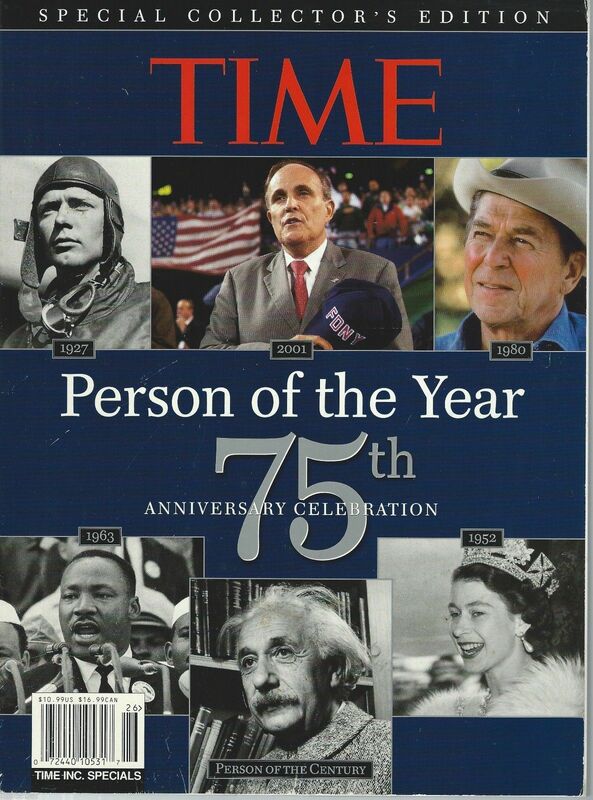 Time - Person of the Year 75th Anniversary Celebration magazine, published in 2002. Features include: Cover Subjects: Rudy Giuliani, Ronald Reagan, Martin Luther King Jr., Albert Einstein (Person of the Century), Charles Lindbergh, Queen Elizabeth. Back Cover: Rudolph Giuliani, American Fighting Man, Corazon Aquino, Pope John Paul II, President-Elect George Bush, Ronald Reagan, Ayatollah Khomeini. Categories: The Heroes Rebels and Visionaries World War II The Cold War Cultures in Conflict The Oval Office Innovators Statesmen Diplomats Surprises This magazine is complete and has 138 pages. Each article is 1-2 short pages, just right to read at bedtime or outside in the yard or on the beach. Condition: minor scratches and edge wear on the covers. Paper Back. Size: 10"-11" Tall (254-279 mm). Mailing Label: This magazine does not have a mailing label.